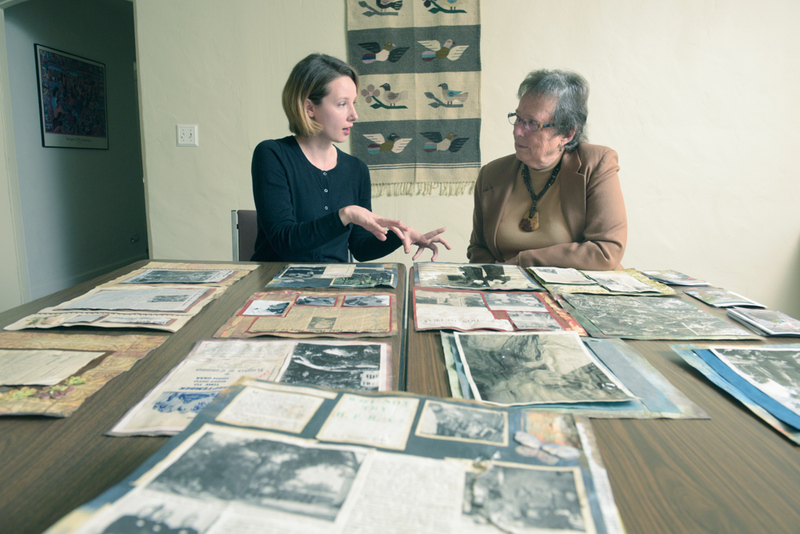 Conservator Christina Bean (left) and Stephanie Glatt, director emerita at La Casa de Maria, go over some of the photos salvaged following the 1/9 Debris Flow. In the beginning of February 2018, a few weeks after the Montecito debris flow, I was contacted about a few people looking to conserve six things rescued from the mud. I proposed a free assessment day, where people could bring anything they wanted to the Montecito Library, and I would help where I could and give out resources and contacts for other conservators with different specialties. I soon realized that there was a huge mold problem everywhere. I shouldn’t have been surprised. Mud and debris blanketed the town, creating a micro-environment where items could not dry out — the perfect breeding ground for mold and insects. Families had few options for help, so I created another. The following week I began calling other conservators, did some research, and decided to try a project that had never been done before — conservation support on a community basis. I felt it was a project that was desperately needed, and since I had just spent the last three years finishing my master’s in conservation from Camberwell College of London and a fellowship at UCLA Library, I had the time to devote to the work. Besides, my family was from here, and I wanted to use what skills I had to help. First I called the Fowler Museum’s Christian De Brer, who had run similar remediation programs. Freezers, he said, were needed immediately. He recommended contacting Martin Container. They agreed to put two freezers on hold at an extremely deep discount. One freezer could go to the Sheriff’s Office, and the other had to be located somewhere in Montecito. I called Sherman Hansen of Santa Barbara County Parks. He put me in touch with Abe Powell, the man who had become the go-to guy for most volunteer recovery projects and one of the prime organizers of the Santa Barbara Bucket Brigade, a group of ordinary people who, working with donated funds, had been digging through the mud. Abe immediately recognized the need for a conservation service but soon realized there was no power source in Montecito that could handle such large freezers. The Bucket Brigade offered to rent necessary generators, and because of that incredibly generous act, I was able to accept Westmont College’s offer to park the freezer on its campus. The project also received seed funding from Congregation B’nai B’rith to acquire the first wave of supplies and the Montecito Center for Preparedness, Recovery and Rebuilding, a county group run by Ben Romo, offered free studio space. Now I only had to wait for Abe to fire the generators up. “Oh, no,” I answered without thinking. “I did humanitarian aid work in Kosovo after the war, so this should be old hat.” My answer startled us both. He had not known about this part of my early life, and I rarely talked about it with strangers. I had spent nine months in that terrible war zone with my family in 1999, handing out aid packages and running team logistics, an experience that left me with complex post-traumatic stress disorder (C-PTSD). After Kosovo I had found it hard to volunteer helping people elsewhere. But I had spent years getting better, and since I was going to be helping objects and not people, I was confident this was something I could do. I officially started accepting drop-off objects on March 8, and I was soon flooded with items. I was grateful for volunteers and my previous database experience because those two things were essential to the survival of the project. Over the next few weeks, the relationship between 805 Conservation and the Bucket Brigade became more formalized. They became our nonprofit umbrella and provided the rest of the funding, so I could just focus on the objects. From the very beginning, I wanted the project to be free for the public with no restrictions on what people could bring. Since this was Bucket Brigade’s feeling as well, it just confirmed the synergy of our working groups. My specialty is paper-based objects, but every type of object came my way. Fortunately, conservation as a profession is obsessed with sharing knowledge, and I quickly found a group of conservators with different specialties who were happy to help. They guided me through textiles, metal pieces, ceramics, paintings, and stuffed animals. Having no restrictions on what could be brought worried everyone, and I was asked, “Shouldn’t there be limits to prevent people taking advantage?” But I had faith in the families. And they proved me right. Every family self-edited what they brought. Understanding that the service was free actually made them choose carefully. As the project went on and the work piled high, families would bring me snacks and drinks in the hot afternoons. They would bring me supplies if they noticed I had been running low and would occasionally do small tasks, like taking out my trash. And I got many, many hugs. But the project began to wear on me as the objects increased from 6 to 7,000. Remember how I said that my C-PTSD wouldn’t be a problem because I was helping objects and not people? Well, it turns out that fixing objects does help people. I had no comprehension of the impact it would have or the bond it would forge between us all. Going through a family’s personal belongings is a free fall into family memories, and they would tell me the stories that went with the objects. Over time my general concern for strangers became a deep caring for friends. It was a light-bulb moment for me. The heart has endless reserves to care about people, but the body and mind need a bit of patience and understanding while they catch up. And I hadn’t been giving myself any time or space to do that. So, if you are going to help with disasters in your own community, look up compassion fatigue and use the prevention techniques to help yourself and others. Caring begets caring, and through this project I was fortunate to join a chain that wound throughout the entire community that worked to support survivors and responders alike. My fellow nonprofits, volunteers, and the families who sought my help all collaboratively gave me everything I needed to finish out the work and safely return the objects to those who loved them. This project has been one of the best of my life. I know I will carry the connections formed, the love felt, and the stories told with me for the rest of my life. Christina Bean has decided to stay in town and start her own paper conservation studio under 805 Conservation.